On the last day of February in 1975, seven men from among a gang who authored one of Singapore’s signature murders were hanged at Changi Prison. 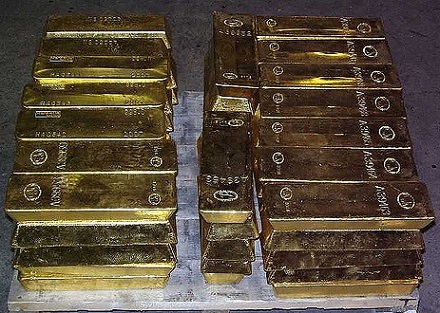 (cc) image from Bullion Vault. Four days after Christmas in 1971, the phone rang for Andrew Chou, an Air Vietnam staffer who had been exploiting his security credentials to smuggle gold bars out of Singapore for several crime syndicates. It was a fresh delivery for the Kee Guan Import-Export Co. for that evening — to be dropped at Chou’s house as usual. Chou’s cut of these runs was lucrative, of course: hundreds of thousands in cash, out of which the able crook paid off his own muscle as well as the air crew. But this night, he intended to take a lump sum. As the couriers counted out the treasure at Chou’s kitchen table, Chou and associates attacked them. Later, Chou would phone his contacts to advise that the goldmen had never arrived that night: in fact, Ngo Cheng Poh, Leong Chin Woo and Ang Boon Chai had been consigned to the industrial muck of a convenient mining pool. This incident, soon to be known as the Gold Bar Murders, went wrong very quickly but perhaps the judicial punishment visited on its perpetrators only spared them from a similar underworld revenge. An anonymous tipster had seen the bodies being dumped and police pulled them out of the ooze the next day. The smuggling-murder circle was busted immediately; a few gold bars were recovered from the office of Chou’s brother Davis, and the balance from an associate named Catherine Ang, who had received them for safekeeping from the hands of the killers. There were 10 in this conspiracy. One, Augustine Ang,* saved his own life by giving evidence against his comrades. Two others, Ringo Lee and Stephen Lee, were minors at the time of the murder and escaped the noose on that basis. The remaining seven — Andrew Chou, David Chou, Peter Lim, Alex Yau, Richard James, Stephen Francis, and Konesekaran Nagalingam — all hanged without their appeals availing any of them the least whiff of judicial or executive mercy. * There was no blood relationship between the murderer Augustine Ang, the victim Ang Boon Chai, and the fence Catherine Ang.